Ivory Stineway, under jockey Guillermo Suarez, setting the fastest qualifying time for the Wild West Futurity at Los Alamitos Race Course Sunday night. LOS ALAMITOS, CA� OCTOBER 5, 2014�Ryan Hanson saddled a pair of trial winners to the $141,800 Wild West Futurity on Sunday night at Los Alamitos Race Course. The trial wins were the beginning of what will be a memorable 24 hours for the trainer. He�ll be back in the barn at around 3 a.m. on Monday morning to see off several horses from his stable that will be traveling to compete in the October 18 Bank of America Challenge Championship Night at Prairie Meadows in Iowa. Hanson will then drive up to the California Coast to San Luis Obispo where at 3 p.m. on Monday he�ll marry racing analyst Michelle Yu, a popular host on HRTV and also the host of the satellite broadcast show during the Thoroughbred meets at Los Alamitos. Hanson now has a couple of Wild West finalists to fine tune as well after trial winners Steinway Ivory and CR Proud Prince qualified to the October 26 finale. Owned by Rob Evans and Hanson Racing LLC, Steinway Ivory won the opening 350-yard trial by a neck while covering the distance in the fastest qualifying time of :17.779. Ridden by Guillermo Suarez, the victory was the IVORY JAMES gelding�s fourth in eight career starts. 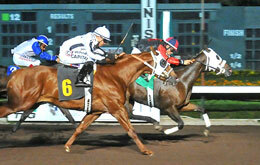 Blaine Bateman bred the bay runner out of the major futurity finalist Christie Jo Dash. �He has ability and is a solid horse,� Hanson said. �He�s been good to us. Rob Evans and I have been friends for a while now and it�s nice to have this horse make the final. This horse has drawn the outside a couple of times and he doesn�t want to run when he�s on the outside. He ran a nice race tonight (from post five). Guillermo has helped us since the Spring. He�s worked hard for us and he tries hard on race nights. � Hanson had the bookends in the list of finalists to the Wild West, as he also saddled the 10th fastest qualifier of the night in Layne Sprouse�s CR Proud Prince.